Geoffrey Roy Rush AC (born 6 July 1951) is an Australian actor and film producer. Rush is the youngest amongst the few people who have won the "Triple Crown of Acting": the Academy Award, the Primetime Emmy Award, and the Tony Award. He has won one Academy Award for acting (from four nominations), three British Academy Film Awards (from five nominations), two Golden Globe Awards and four Screen Actors Guild Awards. Rush is the founding President of the Australian Academy of Cinema and Television Arts and was named the 2012 Australian of the Year. He is also the first actor to win the Academy Award, BAFTA Award, Critics’ Choice Movie Award, Golden Globe Award, and Screen Actors Guild Award for a single performance in film for his performance in Shine (1996). Rush was born in Toowoomba, Queensland, the son of Merle (Bischof), a department store sales assistant, and Roy Baden Rush, an accountant for the Royal Australian Air Force. His father was of English, Irish, and Scottish ancestry, and his mother was of German descent. His parents divorced when he was five, and his mother subsequently took him to live with her parents in suburban Brisbane. Before he began his acting career, Rush attended Everton Park State High School and graduated from the University of Queensland with bachelor's degree in Arts. While at university, he was talent-spotted by Queensland Theatre Company (QTC) in Brisbane. Rush began his career with QTC in 1971, appearing in 17 productions. Rush's acting credits include Shakespeare's plays, The Winter's Tale (with the State Theatre Company of South Australia in 1987 at The Playhouse in Adelaide) and Troilus and Cressida (at the Old Museum Building in 1989). He also appeared in an ongoing production of Oscar Wilde's The Importance of Being Earnest as John Worthing (Ernest) (in which his wife, Jane Menelaus, appeared as Gwendolen). In 2011, Rush played the lead in a theatrical adaptation of Nikolai Gogol's short story The Diary of a Madman at the Brooklyn Academy of Music. Rush won for this role Helpmann Award and was nominated for the Drama Desk Award. Rush made his film debut in the Australian film Hoodwink in 1981. His next film was Gillian Armstrong's Starstruck, the following year. In the coming years he appeared in small roles on television dramas, including a role as a dentist in a 1993 episode of the British television series Lovejoy. He made his breakthrough performance in 1996 with Shine, for which he won the Academy Award for Best Actor. In 1998, he appeared in three major films: Les Misérables, Elizabeth, and Shakespeare in Love for which he received his second Academy Award nomination as Academy Award for Best Supporting Actor. In 1999, Rush took the lead role as Steven Price in the horror film House on Haunted Hill. In 2000, he received his third Academy Award nomination, for Quills, in which he played the Marquis de Sade and He role the voice of Bunyip Bluegum in The Magic Pudding. Rush's career continued at a fast pace, with nine films released from 2001 to 2003. He starred in the film Pirates of the Caribbean: The Curse of the Black Pearl, as Captain Hector Barbossa, also appearing in its sequels, Dead Man's Chest, At World's End and On Stranger Tides. Rush reprised his character's voice for the enhancements at the Pirates of the Caribbean attractions at Disneyland and the Magic Kingdom theme parks, which involved an Audio-Animatronic with Rush's likeness being installed (including one at Tokyo Disneyland). He also voiced Nigel the pelican in Finding Nemo. Rush played actor Peter Sellers in the television film The Life and Death of Peter Sellers. For this performance, he won an Emmy Award for Outstanding Lead Actor in a Miniseries or a Movie, a SAG Award for Best Performance by an Actor in a Television Movie or Miniseries, and a Golden Globe Award for Best Actor in a Miniseries or Motion Picture made for Television. In 2005, he starred in Steven Spielberg's Munich as Ephraim, a Mossad agent. In August 2011 he was appointed the foundation President of the newly formed Australian Academy of Cinema and Television Arts. In 2013, Rush starred alongside Jim Sturgess in The Best Offer and the film version of the best-selling novel The Book Thief. Since 1988, Rush has been married to actress Jane Menelaus, with whom he has a daughter, Angelica (born 1992), and a son, James (born 1995). Rush lives in the Melbourne suburb of Camberwell, Victoria. Appointed a Companion of the Order of Australia (AC) in 2014, Australia's highest civilian honour, for eminent service to the arts as a theatre performer, motion picture actor and film producer, as a role model and mentor for aspiring artists, and through support for, and promotion of, the Australian arts industry. ↑ "Geoffrey Rush". Front Row. 1 May 2013. BBC Radio 4. Retrieved 2014-01-18. ↑ "Geoffrey Rush". Encyclopædia Britannica. Retrieved 5 July 2016. ↑ Singer, Jill "Rush to flat earth". Herald Sun. 24 March 2008. 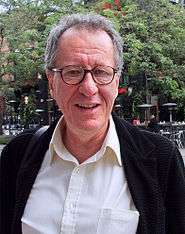 ↑ Geoffrey Rush biography. Film Reference.com. 1 2 3 Geoffrey Rush Biography. Tiscali.film & tv. 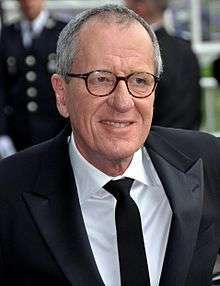 1 2 Geoffrey Rush biography. Yahoo! Movies. 1 2 Geoffrey Rush, 1997 Academy award winner. Alumni at University of Queensland. ↑ "Past nominees and Winners". Helpmann Awards. Retrieved 11 December 2013. ↑ "Tony Awards – Search Past Tony Award Winners and Nominations". Tony Award Productions 2000. Retrieved 11 December 2013. ↑ "The Importance of Being Earnest". Melbourne Theatre Company. Retrieved 17 April 2011. ↑ "Geoffrey Rush". Television Academy. ↑ "Geoffrey Rush to Take a Seat in Drowsy Chaperone Film". Broadway. Retrieved 13 September 2010. ↑ Vilensky, Mike (30 March 2011). "Geoffrey Rush Joins Green Lantern". New York. Retrieved 17 April 2011. ↑ MIFF Trailer 2011 – The Potato Peelers on YouTube (23 June 2011). Retrieved on 2011-11-27. ↑ "Rush named president of Australian Oscars". Australian Broadcasting Corporation. 19 August 2011. ↑ Spencer, Adam; Champness, Lawrence (21 January 2011). "The King's Speech: From Geoffrey Rush's letterbox to the big screen". Australian Broadcasting Corporation. Retrieved 7 September 2012. ↑ "Geoffrey Rush". Department of the Prime Minister and Cabinet. Retrieved 27 January 2014. ↑ "Australian of the Year 2012". National Australia Day Council. Retrieved 27 January 2014. ↑ "Companion (AC) in the general division of the Order of Australia at the 2014 Australia Day honours" (pdf). Official Secretary to the Governor-General of Australia. 26 January 2014. p. 5. Retrieved 27 January 2014.